No doubt you are aware of the Ice Bucket Challenge videos spreading through the internet like wildfire. The purpose of these videos is to raise awareness and funds for a disease called ALS. Before this social media phenomenon began, many of the participants and viewers of the videos probably never even knew what this cruel disease is all about. I did, because my own sister passed away four years ago from ALS. That’s why I am glad my husband and children responded to their challenges, though they realize the momentary discomfort of being deluged with ice water is nothing compared to suffering from the disease. As Christians, however, we need to raise awareness for another disease that is even worse than ALS. It’s an infirmity that attacks your heart, then your mind, and finally your body. It causes you to do things that hurt yourself and others. Lastly, it causes an awful, drawn-out death where you feel like you are burning with a fever you’ve never felt before. This horrific disease is called sin. Sadly, I must tell you that I have this disease. Thankfully, when I was a teenager someone told me about the cure found in Jesus Christ and I no longer have to fear dying from this malady! My husband and I are so grateful for what Jesus did to save us from this eternal death, that we can’t help but share His cure with others. That is precisely why we are in Argentina. Those who support us on the mission field don’t need to make a video of themselves throwing ice water on their head, nor do they need to be publicly challenged on social media. They respond to the Lord’s leading in their life, praying for us and quietly write out their check and place it in the offering plate or the mail box. For you, we are grateful. There may be others out there who do not give to missions and do not share the Good News of Jesus Christ with others. I challenge you, Christian, to start doing both! I could tell you that you have 24 hours to complete this challenge, but instead I will say that this ought to be a part of your 24/7 daily life. Every day, ask God for a divine appointment [God bringing someone into your life who needs to hear this news] to share His cure for this disease called sin. As you begin to share Christ either through giving out a tract, sharing your personal testimony or giving the Gospel with those who are dying and going to Hell, you will begin to have a burden to do more. You will want to give to missions and even go on mission trips because you love your Savior, Jesus Christ. James & Amy, originally uploaded by IBI Pilar. Quotes taken from The Motley Fool. To read the full article, click here. Honestly, we normally do not get engaged in the politics of Argentina. We always make it clear that we are here in this country to help bring about change – one soul at a time – by sharing the Good News of Jesus Christ. The outright thievery of this government plan helps us to point out that the Christian’s treasure is not here on this earth. No one, no government, no, not even Wall Street, can steal the eternal treasures of the Christian’s good works done for the glory of God. 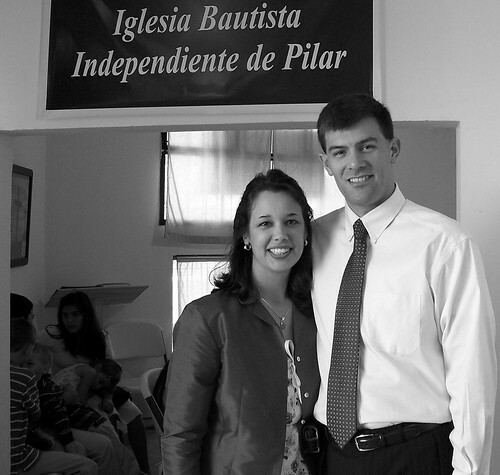 This Saturday, November 1st, we will hold a special meeting to present our vision for Independent Baptist Church in Pilar. We will present the need and the opportunity for those in our Wednesday Bible study group to get involved in the church-planting process. We are ready to take the next step and begin reaching out to the lost in the community. We would like to see our fellow believers take a part in that and lay up their own eternal treasures in Heaven. Please pray for God to work in each heart to show them how they should be personally involved. Every October, Independent Baptist pastors and missionaries from Argentina, Uruguay, Chile, Paraguay, Peru, and Bolivia get together for a time of preaching and teaching from God’s Word. This year the church in Don Torcuato (where we are helping) hosted the annual event. James organized and led the music, and Amy organized and taught in the children’s program. It was a joy to serve in this capacity and to fellowship with God’s servants! Click here to see pictures of the conference. Our children have been learning so much of the culture and “life lessons” by being able to run freely in the neighborhood while playing with the other children. We are so thankful for these learning opportunities for the kids. Jaden and Lauren are both taking piano lessons now, and doing quite well. Maybe we’ll have a pianist by the time we get our own church building! When our son Josiah is working through his daily schoolwork, he often says, “We’re just cruising along here!” This is also the case with the new work in Pilar. We are “cruising” through each doctrine from our doctrinal statement. As expected, we hit a little bump in the road when we came to the gifts of the Spirit. Those who come from Pentecostal backgrounds were very confused by the false teaching they have believed. Please pray that we would deal with each person with wisdom and the love of Christ. We also continue with one-on-one discipleship with Benjamin, Alejandro, Veronica, Andrea, and Virginia. We have seen remarkable progress in the spiritual growth of each one. They have each opened up to us, sharing their struggles and how the Lord has worked in their lives. May the Lord be praised that we would be able to learn enough of the language and culture in order to minister to the hearts of these precious saints.